Karlsruhe, Germany – July 18, 2013 – Altium Limited, a global leader in Smart System Design Automation and provider of solutions for 3D PCB design (Altium Designer) and embedded software development (TASKING), has released a new range of component libraries for board-level designs using the ARM® Cortex-M™ based EFM32 Gecko microcontrollers, which were developed by Energy Micro, recently acquired by Silicon Labs. Available now from AltiumLive the solution delivers board-level component models and corresponding supply chain information, such as real-time price and availability data from distributors and vendors including Digi-Key, Arrow and Farnell, directly to designers using Altium's electronics design software, Altium Designer. A component model hosted in AltiumLive includes the schematic symbol, PCB footprint and a detailed 3D model for 3D mechanical integration during the PCB design process. Corresponding component price and availability data is drawn directly from vendor and supplier web services. AltiumLive also provides access to a host of design-related content including training and design tips videos, reference designs and a large range of documentation resources. The release of EFM32 libraries for board-level design covers the entire Gecko microcontroller range with over 240 scalable MCU options. 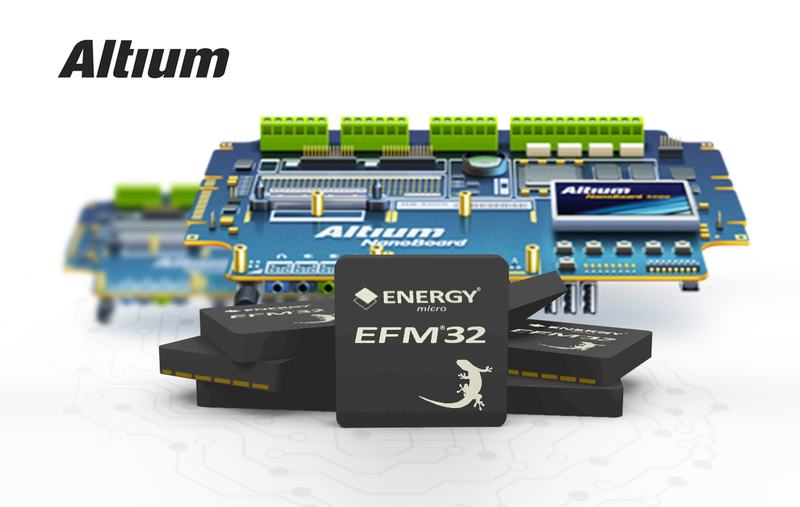 The EFM32 products are extremely energy efficient 32-bit microcontrollers suitable for ultra-low-power applications. Energy Micro built their EFM32 microcontrollers around the 32-bit ARM Cortex-M4 with FPU, Cortex-M3 and Cortex-M0+ processor cores, which enable low active power consumption, reduced processing time, very fast wake-up time and ultra-low standby current. “Altium’s solution is a fresh and unified tool for electronics design”, said Øyvind Grotmol, Senior Engineering Director, Software for Silicon Labs’ Microcontroller business group. “We really support the simplicity aspect when it comes to development and design, and the combination of our EFM32 MCU portfolio paired with tools that make everything readily available for the designer is a key aspect when customers choose a product platform”. Visit the Community > Design Content section in AltiumLive at http://live.altium.com/ for information on components from Energy Micro and other suppliers, as well as additional details on board-level components and how they are accessed in Altium Designer. More information about the TASKING development toolset for ARM can be found on Altium’s TASKING website at http://tasking.com/products/arm/ . Silicon Labs is an industry leader in the innovation of high-performance, analog-intensive, mixed-signal ICs. Developed by a world-class engineering team with unsurpassed expertise in mixed-signal design, Silicon Labs’ diverse portfolio of patented semiconductor solutions offers customers significant advantages in performance, size and power consumption. For more information about Silicon Labs, please visit www.silabs.com. Founded in 1985, Altium has offices in San Diego, Sydney, Karlsruhe, Shanghai, Tokyo, Kiev, Amersfoort with value added resellers worldwide. For more information, visit www.altium.com. You can also follow and engage with Altium via Facebook, Twitter and YouTube.